The network of commercial airlines across the globe has reached its peak level. Thousands of flights take-off and land at international airports around the world. Keeping track of planes in this vast network is truly a tedious task. Tracking a particular flight on which perhaps your relative is travelling, or knowing the flight schedule, these things were not possible before without the help of authorities. 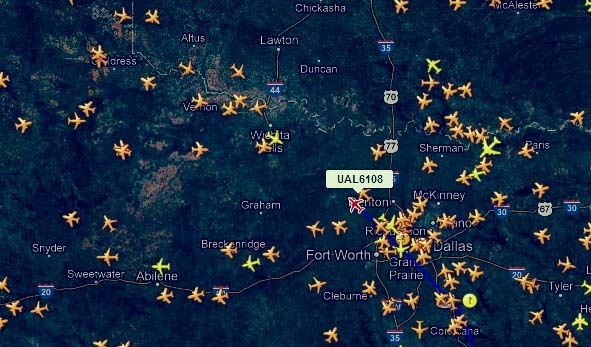 Thanks to Flightradar24, now you can do all that right from your web browser. Flightradar24 provides real-time flight information for all leading airliners across the globe and also lets you track the journey of particular aircraft at real-time. The technique they use is called Automatic dependent surveillance-broadcast (ADS-B), a technology that is set to replace radar in the near future. The speciality of ADS-B is that it can provide real time update. The flights are always visible, unlike a radar which only would emit periodic signals. However, the flight needs to be equipped with an ADS-B transponder in order to be detected and so flights currently not equipped with the transponder will not be displayed on the website. As of now, only 60% of the aircrafts, including about 30% of US flights, about 70% of European flights and only a few military aircrafts have ADS-B transponders in them. For more information on which flights are displayed in Flightradar24, refer to this list below. Flightradar24 is increasing its flight coverage from real-time data shared by number of airports around the world with more and more airports joiningthe network over time. Route Tracking for individual flights. Different aircraft types depicted by different icons. Real-Time airport scenario showing flights entering and leaving a particular airport. Real-Time data search, including fleet, flight and airport searches. Flightradar24 Mobile apps are also available for iPhone and Android. It features Push Notifications, aircraft tracking in real-time, airline searches and a special ability to identify overhead flying planes by just pointing the phone’s camera at the sky. The app is available on the App Store for iPhone and Google Play for Android devices. Additionally, Flightradar24 app is also available for Mac users. Get it on the Mac App Store. Even though currently not all flights are detected by the system because ADS-B transponders are not present on every aircraft, this tool will be very useful in the near future as ADS-B will eventually replace radar technology.